Today we continue our study in 1 Corinthians as we look at chapter 6. All throughout the book Paul addresses judgement in and out of the church. 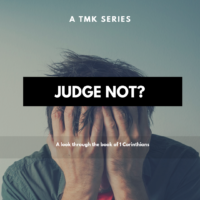 Judgment is a thing to be avoided today, it is an often abused topic today, even in the church. What does 1 Corinthians teach us about judgment and the church? Jesus Outside the Lines: A Way Forward for Those Who are Tired of Taking Sides.